worst than hail of blades? in > New DH - Possible bug? New DH - Possible bug? 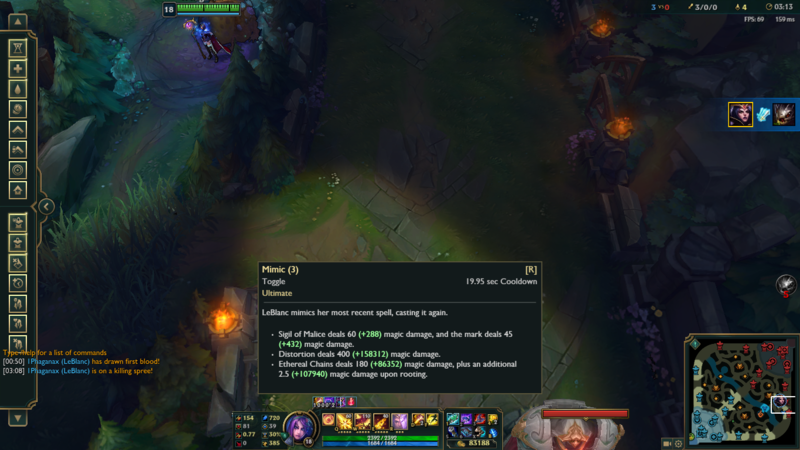 in > Explain to me why Sona is disabled in ARURF, but you can still play fizz. : Hail of blades only makes gives you attack speed for 3 auto attacks so its not as op as lethal tempo where you can easily get over 5 attack speed for 6 seconds. Here is a clip from a Rioter who tested [this](https://streamable.com/3b3mf) (keep in mind, you would attack even faster if you were ranged because of the 100% attack speed boost) Im pretty sure conqueror and nimbus cloak arent disabled either. in > Xerath Q bug????? : Gonna make a quick timeline: We used to have both: this resulted into long queue times for both. Riot disabled blind pick and put up draft. People complained that new things were banned constantly and thus could not be tested. We also could not test mirror matches. Riot disabled draft pick and enabled blind pick. Then people got mad that with blind pick, people instalocked, couldn't get their roles, had toxic experiences, people dodged a lot, etc etc. Riot compromised, and enabled draft pick with role selection but without bans. Right now, enabling blind pick would bring back the same problem they tried to fix: longer queue times. Ranked was disabled recently for the same reason. Only downside now is no mirror matches. in > I want a explanation: why dont have "blind picks" in pbe? I want a explanation: why dont have "blind picks" in pbe? : Here's what's gonna happen. Vayne gets nerfed -> Tristana and Twitch ruin another season -> Tristana and Twitch won't get nerfed. 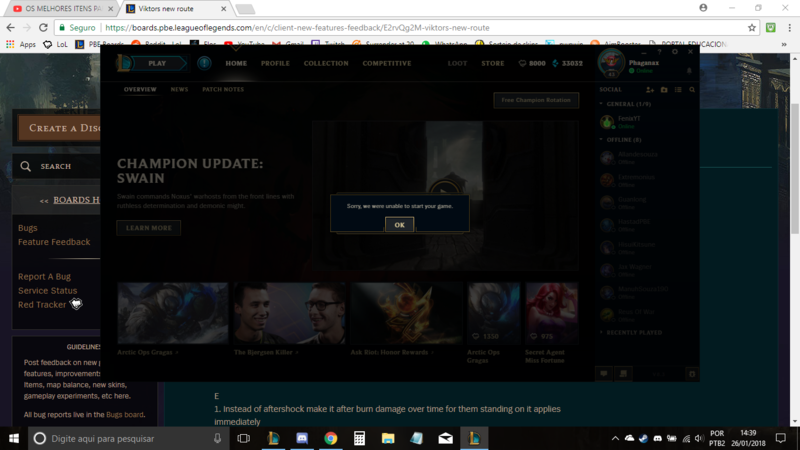 im sorry, im new in PBE =/, just giving feedback i have to delete and repost? : She didn't drop twice, the biscuit is from the 3:00 biscuit rune. : Electrocute doesn't add too terribly much to an early combo, especially since it's 40+10xlevel magic damage with a fairly hefty cooldown early on. The training dummies don't quite accurately portray this, since they have 100 armor, meaning you won't benefit as much from your Lethality reds as you would against a squishy. 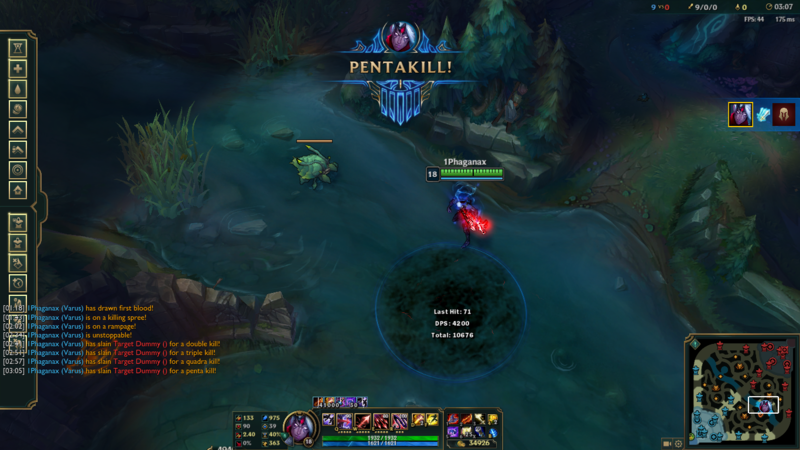 Also, if Xerath is in melee range of an enemy AD assassin, he honestly deserves to get chunked.